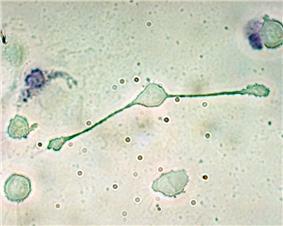 Macrophages (Greek: big eaters, from makros "large" + phagein "eat"; abbr. MΦ) are a type of white blood cell that engulfs and digests cellular debris, foreign substances, microbes, cancer cells, and anything else that does not have the types of proteins specific to the surface of healthy body cells on its surface in a process called phagocytosis. Macrophages were first discovered by Élie Metchnikoff, a Russian bacteriologist, in 1884. They are found in essentially all tissues, where they patrol for potential pathogens by amoeboid movement. They play a critical role in non-specific defense (innate immunity), and also help initiate specific defense mechanisms (adaptive immunity) by recruiting other immune cells such as lymphocytes. In humans, dysfunctional macrophages cause severe diseases such as chronic granulomatous disease that result in frequent infections. Beyond increasing inflammation and stimulating the immune system, macrophages also play an important anti-inflammatory role and can decrease immune reactions through the release of cytokines. Macrophages that encourage inflammation are called M1 macrophages, whereas those that decrease inflammation and encourage tissue repair are called M2 macrophages. This difference is reflected in their metabolism, M1 macrophages have the unique ability to metabolize arginine to the "killer" molecule nitric oxide, whereas M2 macrophages have the unique ability to metabolize arginine to the "repair" molecule ornithine. When a neutrophils, macrophages survive longer in the body up to a maximum of several months. Macrophages are highly specialized in removal of dying or dead cells and cellular debris. This role is important in chronic inflammation, as the early stages of inflammation are dominated by neutrophil granulocytes, which are ingested by macrophages if they come of age (see CD31 for a description of this process). Macrophages are essential for wound healing. They replace Polymorphonuclear neutrophils as the predominant cells in the wound by two days after injury. Attracted to the wound site by growth factors released by platelets and other cells, monocytes from the bloodstream enter the area through blood vessel walls. Numbers of monocytes in the wound peak one to one and a half days after the injury occurs. Once they are in the wound site, monocytes mature into macrophages. The spleen contains half the body's monocytes in reserve ready to be deployed to injured tissue. The macrophage's main role is to phagocytize bacteria and damaged tissue, and they also debride damaged tissue by releasing proteases. Macrophages also secrete a number of factors such as growth factors and other cytokines, especially during the third and fourth post-wounding days. These factors attract cells involved in the proliferation stage of healing to the area. Macrophages may also restrain the contraction phase. Macrophages are stimulated by the low oxygen content of their surroundings to produce factors that induce and speed angiogenesis  and they also stimulate cells that reepithelialize the wound, create granulation tissue, and lay down a new extracellular matrix. By secreting these factors, macrophages contribute to pushing the wound healing process into the next phase. Macrophages can express Leydig cells by secreting 25-hydroxycholesterol, an oxysterol that can be converted to testosterone by neighbouring Leydig cells. Also, testicular macrophages may participate in creating an immune privileged environment in the testis, and in mediating infertility during inflammation of the testis. Macrophages contribute to tumor growth and progression. Attracted to oxygen-starved (hypoxic) and necrotic tumor cells they promote chronic inflammation. Inflammatory compounds such as Tumor necrosis factor (TNF)-alpha released by the macrophages activate the gene switch nuclear factor-kappa B. NF-κB then enters the nucleus of a tumor cell and turns on production of proteins that stop apoptosis and promote cell proliferation and inflammation. Moreover macrophages serve as a source for many pro-angiogenic factors including vascular endothelial factor (VEGF), tumor necrosis factor-alpha (TNF-alpha), granulocyte macrophage colony-stimulating factor (GM-CSF) and IL-1 and IL-6  contributing further to the tumor growth. Macrophages have been shown to infiltrate a number of tumors. Their number correlates with poor prognosis in certain cancers including cancers of breast, cervix, bladder and brain. Tumor-associated macrophages (TAMs) are thought to acquire an M2 phenotype, contributing to tumor growth and progression. Recent study findings suggest that by forcing IFN-α expression in tumor-infiltrating macrophages, it is possible to blunt their innate protumoral activity and reprogramme the tumor microenvironment toward more effective dendritic cell activation and immune effector cell cytotoxicity. ^ Regenerative Medicine Partnership in Education https://www.sepa.duq.edu/regmed/immune/macrophages.html. ^ Semyon Zalkind (2001). Ilya Mechnikov: His Life and Work. Honolulu, Hawaii: University Press of the Pacific. pp. 78, 210. ^ Ovchinnikov, Dmitry A. (2008). "Macrophages in the embryo and beyond: Much more than just giant phagocytes". Genesis (Institute for Molecular Bioscience and Cooperative Research Centre for Chronic Inflammatory Diseases (CRC-CID), University of Queensland, Brisbane, Queensland, Australia. : researchgate.net) 46 (9): 447–62. ^ Mills, C. D. (2012). "M1 and M2 Macrophages: Oracles of Health and Disease". Critical reviews in immunology 32 (6): 463–488. ^ Krombach, F., Münzing, S., Allmeling, A. M., Gerlach, J. T., Behr, J., Dörger, M. (1 September 1997). "Cell size of alveolar macrophages: an interspecies comparison". Environ. Health Perspect. 105 Suppl 5 (Suppl 5): 1261–3. ^ Khazen, W., M'bika, J. P., Tomkiewicz, C.; et al. (October 2005). "Expression of macrophage-selective markers in human and rodent adipocytes". FEBS Lett. 579 (25): 5631–4. ^ a b c Sabine A. Eming1, Thomas Krieg and Jeffrey M. Davidson (2007). "Inflammation in Wound Repair: Molecular and Cellular Mechanisms" (PDF). come.mx. Retrieved 2013-08-17. Monocytes/macrophages. Unless stimuli for neutrophil recruitment persist at the wound site, the neutrophil infiltration ceases after few days, and expended neutrophils are themselves phagocytosed by macrophages, which are present at the wound side within 2 days after injury. ^ David M. Mosser and Justin P. Edwards (December 2008). "Exploring the full spectrum of macrophage activation". Nature Reviews Immunology 8 (12): 958–969. ^ "The lymphocyte story". New Scientist (1605): 1. Retrieved 2007-09-13. ^ Galdiero, MR; Garlanda, C; Jaillon, S; Marone, G; Mantovani, A (2012). "Tumor associated macrophages and neutrophils in tumor progression". J Cell Phys 228 (7): n/a. ^ Hotamisligil GS (2010). "Endoplasmic reticulum stress and atherosclerosis". ^ Oh J, Riek AE, Weng S, Petty M, Kim D, Colonna M, Cella M, Bernal-Mizrachi C (2012). "Endoplasmic reticulum stress controls M2 macrophage differentiation and foam cell formation". ^ Krippendorf, BB; Riley, DA (January 1993). "Distinguishing unloading-versus reloading-induced changes in rat soleus muscle". Muscle Nerve 16 (1): 99–108. ^ a b c St Pierre BA, JG Tidball (1994). "Differential response of macrophage subpopulations to soleus muscle reloading following rat hindlimb suspension". Journal of Applied Physiology 77 (1): 290–297. ^ Tidball JG, Berchenko E, Frenette J (1999). "Macrophage invasion does not contribute to muscle membrane injury during inflammation". Journal of Leukocyte Biology 65 (4): 492–498. ^ a b Schiaffino S, Partridge T (2008). Skeletal Muscle Repair and Regeneration. Advances in Muscle Research 3. p. 380. ^ a b de la Torre J., Sholar A. (2006). Wound healing: Chronic wounds. Emedicine.com. Accessed January 20, 2008. ^ Expert Reviews in Molecular Medicine. (2003). The phases of cutaneous wound healing. 5: 1. Cambridge University Press. Accessed January 20, 2008. ^ Lorenz H.P. and Longaker M.T. (2003). Wounds: Biology, Pathology, and Management. Stanford University Medical Center. Accessed January 20, 2008. ^ Swirski, F. K.; Nahrendorf, M.; Etzrodt, M.; Wildgruber, M.; Cortez-Retamozo, V.; Panizzi, P.; Figueiredo, J.-L.; Kohler, R. H.; et al. (2009). "Identification of Splenic Reservoir Monocytes and Their Deployment to Inflammatory Sites". Science 325 (5940): 612–616. ^ Jia, T.; Pamer, E. G. (2009). "Dispensable But Not Irrelevant". Science 325 (5940): 549–550. ^ Deodhar, AK; Rana, RE (4/1/1997). "Surgical physiology of wound healing: a review". Journal of Postgraduate Medicine 43 (2): 52–6. ^ Rosenberg L., de la Torre J. (2006). Wound Healing, Growth Factors. Emedicine.com. Accessed January 20, 2008. ^ Newton, P. M.; Watson, J. A.; Wolowacz, R. G.; Wood, E. J. (2004). "Macrophages Restrain Contraction of an In Vitro Wound Healing Model". Inflammation 28 (4): 207–14. ^ Greenhalgh, D.G. (1998). "The role of apoptosis in wound healing". The International Journal of Biochemistry & Cell Biology 30 (9): 1019–1030. ^ Mercandetti M., Cohen A.J. (2005). Wound Healing: Healing and Repair. Emedicine.com. Accessed January 20, 2008. ^ Stashak, T.S. ; Farstvedt, E.; Othic, A. (2004). "Update on wound dressings: Indications and best use". Clinical Techniques in Equine Practice 3 (2): 148–163. ^ a b Souppouris, Aaron (2013-05-23). "Scientists identify cell that could hold the secret to limb regeneration". the verge.com. Researchers have identified a cell that aids limb regrowth in Salamanders. Macrophages are a type of repairing cell that devour dead cells and pathogens, and trigger other immune cells to respond to pathogens. ^ a b James W. Godwin, Alexander R. Pinto, and Nadia A. Rosenthal (2013-04-24). "Macrophages are required for adult salamander limb regeneration". University of Texas. ^ Mosser, DM; Edwards, JP (Dec 2008). "Exploring the full spectrum of macrophage activation.". Nature reviews. Immunology 8 (12): 958–69. ^ Ryan KJ, Ray CG (editors) (2004). Sherris Medical Microbiology (4th ed.). McGraw Hill. ^ "Chikungunya Disease: Infection-Associated Markers from the Acute to the Chronic Phase of Arbovirus-Induced Arthralgia". Retrieved 2012-06-14. ^ Lucas AD, Greaves DR (November 2001). "Atherosclerosis: role of chemokines and macrophages". Expert Rev Mol Med 3 (25): 1–18. ^ Gary Stix (July 2007). "A Malignant Flame". Scientific American 297 (1): 46–9. ^ Lin EY, Li JF, Gnatovskiy L, Deng Y, Zhu L, Grzesik DA, et al. (2006). "Macrophages regulate the angiogenic switch in a mouse model of breast cancer". Cancer Res 66: 11238–46. ^ Bingle L, Brown NJ, Lewis CE. The role of tumour-associated macrophages in tumour progression: implications for new anticancer therapies. J Pathol 2002; 196:254-65. ^ Escobar G, Moi D, Ranghetti A, et al. (Jan 2014). "Genetic engineering of hematopoiesis for targeted IFN-α delivery inhibits breast cancer progression.". Sci Transl Med. 6 (217): 217. ^ Weisberg SP, McCann D, Desai M, Rosenbaum M, Leibel RL, Ferrante AW. Obesity is associated with macrophage accumulation in adipose tissue" Journal of Clinical Investigation 2003; 112:1796-808.